Can games fix our broken reality? | Motivate. Play. Can games fix our broken reality? Jane McGonigal is not your typical game designer. She has a PhD from UC Berkeley (my alma mater!) in performance studies and predicts that a game designer will win a Nobel Peace Prize by the year 2023. She has been the subject of articles in The New York Times, Businessweek, and even Oprah Winfrey's O Magazine. She may not be working on a big-name franchise like Halo or Madden Football - in fact, most of her games aren't videogames at all - but is clearly making an impact felt both within and beyond the game design community, boasting accolades such as a "Top 20 Breakthrough Idea" from the Harvard Business Review and inclusion among Game Developer Magazine's 50 most important game developers (see her website for a complete list of her "achievements unlocked"). I don't mean for this to come off as simple horn-tooting on McGonigal's behalf, but she's clearly making a splash and it seems worthwhile to see what all the fuss is about. She's what's called an 'alternate reality' game designer (a new term for me, I'll admit) and is a firm believer in the power of games to elicit positive changes in the real world. Under her definition, ARGs are "games that are designed to improve real lives or solve real problems", and she already has quite a few under her belt, including Evoke, World Without Oil, and The Lost Ring. These games are distinct from the kind we usually talk about here on Motivate.Play, generally taking the form of large-scale social games that integrate web elements and real-world activities. Take Evoke - "a crash course in changing the world" - as an example. Here players accept missions online like "Increase the food security of at least one person in your community" or "Design a new way to power something you use everyday", then upload evidence of their progress to the Evoke website. This in turn lets them improve the stats on their personal profiles and progress through the game. It wouldn't be too much of a stretch to characterize McGonigal's work on ARGs as kind of gamification, taking game design techniques out of the realm of pure entertainment and using them as means to real world ends. Her work differs from gamification, however, in two significant respects. First, these are real games. That is to say, McGonigal's work isn't about simply inserting game elements into mundane tasks, but instead developing games from the ground up that (attempt to) achieve something beyond the context of the game itself. Second, the goals she's setting her sights on with her games are definitely of the big picture variety. While I'm sure she's all for self-improvement games to the tune of Wii Fit (some of her games, like CryptoZoo and Superbetter, are specifically focused on achieving personal health goals), McGonigal is pushing to make games into true vehicles of social change. Drawing on positive psychology, cognitive science, and sociology, Reality Is Broken uncovers how game designers have hit on core truths about what makes us happy and utilized these discoveries to astonishing effect in virtual environments. Videogames consistently provide the exhilarating rewards, stimulating challenges, and epic victories that are so often lacking in the real world. But why, McGonigal asks, should we use the power of games for escapist entertainment alone? Her research suggests that gamers are expert problem solvers and collaborators because they regularly cooperate with other players to overcome daunting virtual challenges, and she helped pioneer a fast-growing genre of games that aims to turn gameplay to socially positive ends. I admire the mission McGonigal has undertaken. There is no doubt that the game design community has developed means of getting players deeply engaged in play, so why not direct the energy and capabilities of gamers at something worthwhile? 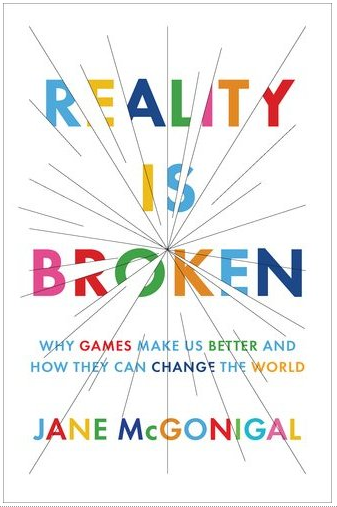 I imagine the title of her book is meant to make a point something like this: reality really is broken, but instead of using games just to escape from it, let's use them to fix it. On principle, it's exceedingly difficult to see any problem with the idea, but I worry that in practice things may not be so simple. I don't doubt for a minute that McGonigal's book will give plenty of examples of ARGs and other games that have proved to be both fun and beneficial (think about Foldit, which has made real progress on protein folding research by turning the process into a competitive game). But I still wonder if these games can achieve the true mainstream acceptance McGonigal is hoping for, since they violate a fairly core tenet of games: we play them in large part because they don't matter in the real world. Perhaps that sounds like a silly thing to propose (I'm happy to hear arguments to the contrary), but I personally think the escapist nature of games that McGonigal hopes to move away from is central to their appeal. She's right that reality is broken, but I worry that players are far more motivated to play games to escape that reality than to try and fix it. The moment you anchor a game to some real-world goal, it becomes more difficult to immerse one's self in it, and this could be a serious obstacle to the ARGs making the big time. I don't know of any research that directly addresses my concerns, and I'm happy to be convinced otherwise, so if any of you have insights please share them. Maybe these types of games will work much better than I'm predicting, or maybe we'll find ways of developing them that don't detract from the immersiveness of the play experience. It's difficult to say. I look forward to reading McGonigal's book, and hopefully she will convince me. But we'll see. Can games fix our broken reality? by Jared Lorince, unless otherwise expressly stated, is licensed under a Creative Commons Attribution-ShareAlike 3.0 Unported License. Hi Jared! This is such a thoughtful article, was happy to see it pop up in my WordPress trackbacks. I will share with you some good news, I think: I don't want to move away from traditional "escapist" games! I foresee a future in which gamers spend ideally 10% of their gaming hours on games like Foldit and EVOKE. 90% of their gaming hours are still on "escapist" (i.e., primarily for positive engagement) games like Halo, Plants vs. Zombies, WoW, Mass Effect, Madden, etc. The entertainment games power us up and give us skills and strengths that we can use to tackle real problems... but we don't have to spend all our time solving problems. The traditional games are totally important! whats up guys has any1 heard about xbox 720 games is this really going to be released by microsoft, if so when? thanks!